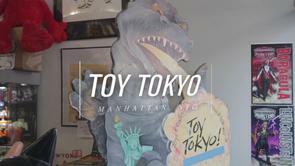 My name is Marley and I'm writing from London based arts & culture blog itdrewitself to let you know about our most recent video release for Dudebox, an interview with Toy Tokyo founder Lev Levarek. We recently met with Lev to talk about the classic and contemporary products found in his epic store! A seminal figure in toy collecting since the 80's, Lev spent his early career traveling the world in hunt of rare and hard to find toy's for collectors in the USA before opening his highly successful Manhattan shop and gallery.